Shops around Lenox, Atlanta is that one spot in the heart of Buckhead that’s a mix of fashion and lifestyle at incredible prices. Check out their site HERE for all that they offer. 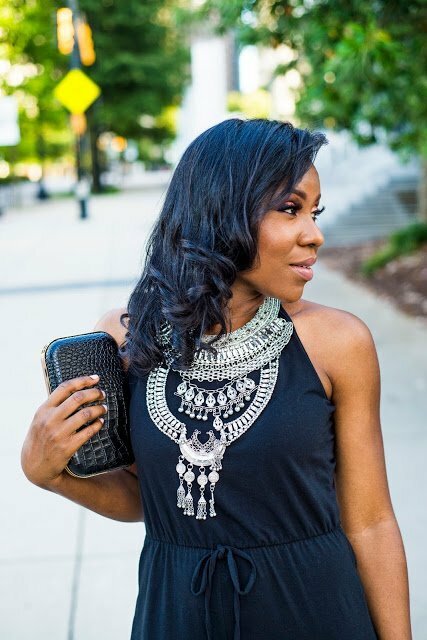 Today I’m sharing my Spring fashion finds from four of the numerous stores located across from Lenox Mall. Hi, How have you been? I hope you had a wonderful weekend? I’m just getting back into the groove of things after a short vacay to Savannah, GA. Recently, I had the opportunity to collaborate with a four of my favorite stores at the Shops Around Lenox. I created the two looks I am sharing today with the finds from The Impeccable Pig, South Moon Under, Fab’rik & Ministry of Supply. Here are three of the qualities l loved about shopping at Shops around Lenox aside from the amazing location. The variety the different shops offered from day time to night time there is something that you would love. The wallet friendly price point! I found lots of options from dresses to jeans and accessories all under $60 some way under. The was impressed with the quality of service Provided by the retail personnel at the different stores. They were helpful. My white dress by Likely is from South Moon Under. Every woman should own a white dress. This dress would be perfect for a special occasion such as graduation, bridal shower or it can be perfect for work in a non-formal environment. Especially when paired with the Women’s kinetic blazer by Ministry of Supply. This wrinkle free blazer fits amazing. I knew the Juliet round bag from Fabri’k would be the perfect accessory to this look. It is available for $62 and it would be a great addition to your spring wardrobe. My earrings and dainty necklace are both from the Impeccable Pig. I wanted a pop of color with my earrings. My sunglasses are from South Moon Under. I decided on a more playful look for my second look with stores at the Shops around Lenox. An outfit that can be worn any day of the week from work casual Friday to a date or hangout after hours. I fell in love with this gingham pants by The Impeccable Pig (check their stores to shop this pants.) Gingham is a classic print and especially perfect for the warmer months. I kept things simple by pairing it with a sleeve top also by the Impeccable Pig and wore a denim jacket (must have for Spring) by Fabri’k. I kept my bag and accessories the same for the look. This sunglasses from South Moon Under is a fav. If you live in the Atlanta area, stopping by the stores is a must! You would love the style options and variety of sizes available. Also check out their various website to shop online. Thank you for reading!